Pretty! 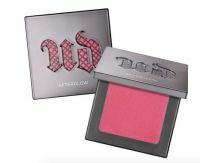 This blush is highly pigmented and definitely lasts all day long. Some nitpicks: It produces a lot of fall-out and it's matte finish isn't as much my jam these days. That said, I would still recommend and purchase. This is a great blush -- superpigmented, which actually makes the bright color a bit tough for me to apply. I have to be very careful not to overapply with just a dab of product. The plus side of that, it will last forever. I found the product to be matte, and so was surprised to read that it's got micro-glimmer. It must be more noticeable in the lighter shades. I like it a lot, but I reach for others before this one. This is an absolutely beautiful blush. The color is super pigmented, making it vibrant on your cheeks, but not so much that you look like a clown. It also has a nice matte finish which is perfect for a natural look (despite the vibrant color). Plus, it ACTUALLY lasts eight hours. I love it!